Home » News , Rides , Safety , Videos » Have You Ever Been Fell From Your Motorcycle While Driving? Have You Ever Been Fell From Your Motorcycle While Driving? 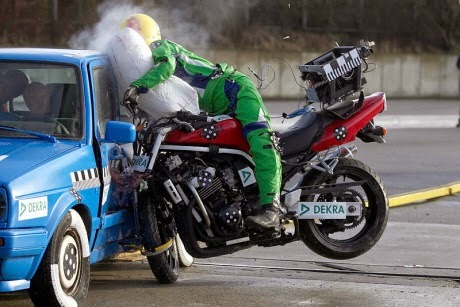 Sometimes we can not avoid accident while driving our motorcycle. It is happening anytime and anywhere without our knowing. It can cause to death or cause to injuries. It is just an unlucky experiences when you got accident while driving. We can not control our destiny when it comes to riding a motorcycle. You know from the start that riding a motorcycle is very dangerous and you just keep in mind you that will be careful in driving to be safe but sometimes in just a moment you fell from your motorcycle while driving. And it will make you shocked. I know or we know the rules of traffic while you are travelling in the highway or even in the town or city. We are aware of the rules but sometimes we forgot to care about our motorcycle. We need to be in good condition when driving and make sure our motorcycle is in good condition also. We need both rules, when driving and riding a motorcyle, you always have your OR,CR and driver's license with you, with safety gears like helmet, elbow and knee protector. Also need to wear hard jeans, riding shoes, jacket and etc just to make sure you are protected. But how about your motorcycle? Before you go driving or riding a motorcycle, you need to check your motorcycle. Check your gasoline, your tires, chain, electrical lines, horn, and etc. just to make it will be in good condition to travel. Always do this basic rules everytime driving a motorcycle. Keeping this in mind, you will safe in all your rides. Always keep in mind to be ride safely.